Citation Information: J Clin Invest. 2007;117(4):971-977. https://doi.org/10.1172/JCI29988. CreERT2 expression is restricted to the pancreas of ElastaseCreERT2 transgenic mice. (A) Schematic depiction of the elastase CreERT2 transgene. The transgene contains the 0.5-kb proximal rat elastase I promoter (Elas; gray), the rabbit β-globin intron (RBG intron; black), the coding region for CreERT2 (white), and the rabbit β-globin polyadenylation cassette (RBG PolyA; black). 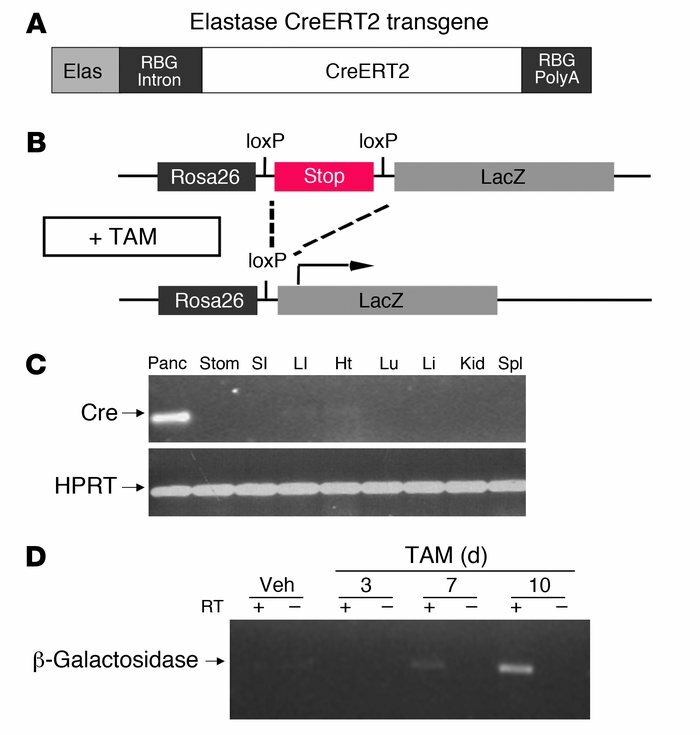 (B) Schematic depiction of the Rosa26r reporter locus and the effect of TAM-induced Cre recombinase activity to excise a loxP-flanked stop sequence (dashed lines), thereby allowing transcription of LacZ (i.e., β-galactosidase; arrow). (C) Tissue distribution of Cre recombinase expression, determined by RT-PCR for Cre recombinase mRNA using total RNA isolated from the designated tissues of 16-week-old transgenic mice. Panc, pancreas; Stom, stomach; SI, small intestine; LI, large intestine; Ht, heart; Lu, lung; Li, liver; Kid, kidney; Spl, spleen. (D) Time course indicating low basal Cre-mediated recombination and high inducibility by TAM administration. RT-PCR for β-galactosidase mRNA carried out using RNA isolated from pancreata of 16-week-old transgenic mice left untreatd or after 3, 7, or 10 days of TAM treatment.